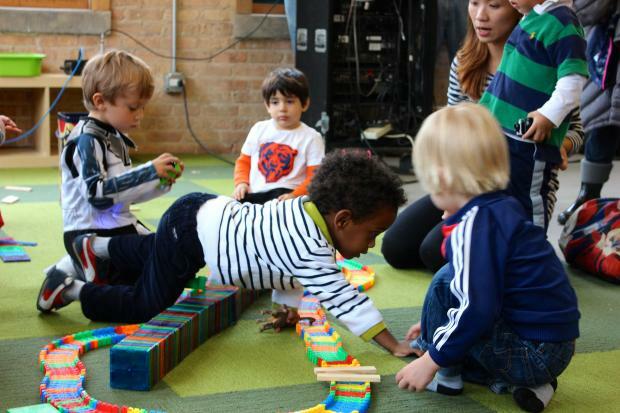 SOUTH LOOP — When a microscope was left out in the Kids Science Lab that shares a building with Whole Foods in Lincoln Park, a group of toddlers got right to work. "We were out of the room for a few minutes," said Shegan Campbell, the program's co-founder and executive director. "By the time we got back, three four-year-olds had taken it apart. And I can't even figure out how to put it back together." The second Kids Science Lab in Chicago, in the South Loop, is designed to incubate that sense of wonder and curiosity with architectural elements like open ceilings, reused materials like shipping crates and a front desk made of cardboard tubes. "It will make them curious," Kids Science Lab co-founder Keith Norsym said. "The space is the beginning of the journey in their classes. Our classes, really what we're doing is we're creating activities that reinforce core science concepts." As an added bonus, it makes the 7,000 square foot lab more eco-friendly, reducing heat costs and reusing recycled resources. Kids are encouraged to write on walls painted with dry erase board and chalk paint, and their questions guide some of the programming. The lab is part of the newly-revamped Chicago Women's Park and Gardens building, which was officially unveiled Thursday with a tour attended by Chicago's first lady, Amy Rule, though Park District programming is already underway in the new spaces. The former home of the National Veterans Art Museum on the second and third floor of the building has been under construction since last year, following an update to the ground level of the building at 1801 S. Indiana St. that was completed in 2010, according to Park District CEO Michael Kelly. The third floor will now house Kids Science Lab programming and other events. Glass-paneled garage doors and modular, movable fixtures can transform the space into a meeting and reception area after hours, according to Norsym. The second floor also has dance rooms and a brand new yoga studio, with an already packed waiting list for the parent/child class. "I remember what this building was when we took a tour in 2009," Kelly said. "It was a dilapidated facility that needed a lot of work." Now, "in the South Loop this is a pillar of our community," he said. "It's a wonderful space now, even for adults, but most importantly, for children. It offers arts and culture, physical activities and learning."